Travel in style with the 12v Mini Beachcomber! This impressive foot to floor Mini Beachcomber 12v Ride On Car from Flying Gadgets will provide hours of fun for your little one! Manually operated using the foot pedals, this high spec car features two seats for children to enjoy as well as a fully licensed BMW Mini badge. The spacious, comfortable seats and large plastic wheels will ensure a smooth ride. Reaching speeds of up to 5km an hour and featuring forward and reverse gears, working LED headlights, engine horn and sounds; this Beachcomber is perfect for little drivers. This car will help your young motoring enthusiast to develop balance and steering skills, and they will be the envy of all their friends as they cruise around in style. 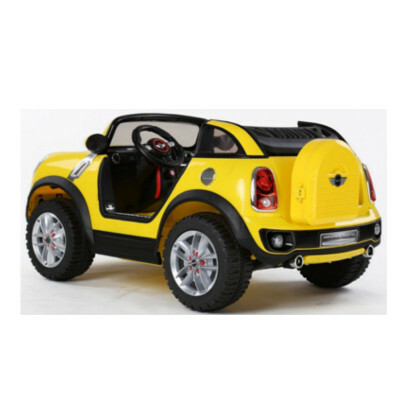 The Mini Beachcomber 12v Ride On Car is perfect for children aged 3 to 6 years of age.